matched to the solar UV spectrum. in order to ensure repeatable results. Battery operation voltage is viable from 9V down to 6.5V. Below 6.5V the numbers on the LCD display will begin to dim indicating the need for battery replacement. Under typical service load a standard 9V battery will last around 2 years. • Wear eye protection when checking UV lamps (Glasses that provide wrap around protection are ideal). • Allow lamps to warm-up prior to taking readings (at least 5 minutes). distance to ensure accurate readings. • For curing lamps, hold the meter at the distance you intend your work piece to be cured. • To take the overall reading at the center of the tanning bed, place meter pointing up with canopy closed. • To take individual lamp readings, hold the meter against the acrylic with canopy open. • This meter is “seeing” the UVA “browning” rays. For erythemal readings use Model 7.0 MED/hr meter. • For acrylic testing, take readings with and without acrylic at a fixed distance. • When comparing different types of lamps consider readings to be relative ather than absolute. • Lamps that peak near 365nm (newer designs) will read higher than lamps that peak near 350nm. • Do not subject the meter to extremes in temperature, humidity, shock or dust. • Use a dry, soft cloth to clean the instrument. Keep sensor free of oil, dirt, etc. 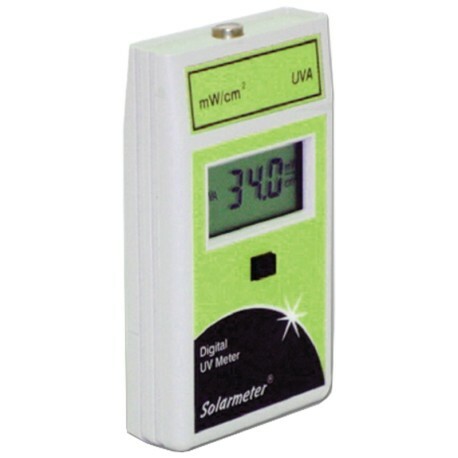 Solarmeter® is Solar Light Company Inc.'s brand of specialty hand-held light meters. We are the industry leader in the design and manufacture of UV and Visible Light radiometers for measuring lamp irradiance vs aging, as well as other related applications serving the indoor tanning industry, window film tint measurement, outdoor UV Index measurement, UV curing, reptile and sterilization lamp measurement, red/blue light phototherapy, LED measurement, and photovoltaic (PV) solar irradiance metrology. These meters provide long term accurate measurements for both low and high intensity lamp systems, in order to enable output and aging determination. They also measure solar irradiance. Since 1991, well over 30,000 of these hand-held digital meters have been produced and sold worldwide. Each Solarmeter® radiometer model comes complete with a carrying case and instruction brochure. Models 4.0 through 9.6 include a NIST-traceable Calibration Certificate, while Model 10.0 includes a WRR-traceable Calibration Certificate. Generally, lamps need replacement when their output declines 30% (falls below 70% of their new values.) This may occur after anywhere from a few hundred to >1000 hours of use, depending on many various factors. The only way to know for sure is to monitor irradiance with a meter! Please be sure to visit all the pages on this site to learn more about each specific model. Solar Light Company, Inc. is recognized worldwide for over 50 years as America's premier manufacturer of precision ultraviolet light sources, solar simulators, and radiometers. Our standard line of UV, visible, and IR radiometers and light meters measure laboratory, industrial, environmental, and health related light levels with NIST traceable accuracy. Column ozone, aerosol, and water vapor thickness measurements, in addition to long-term global ultraviolet radiation studies all over the world are performed using our atmospheric line of instrumentation. 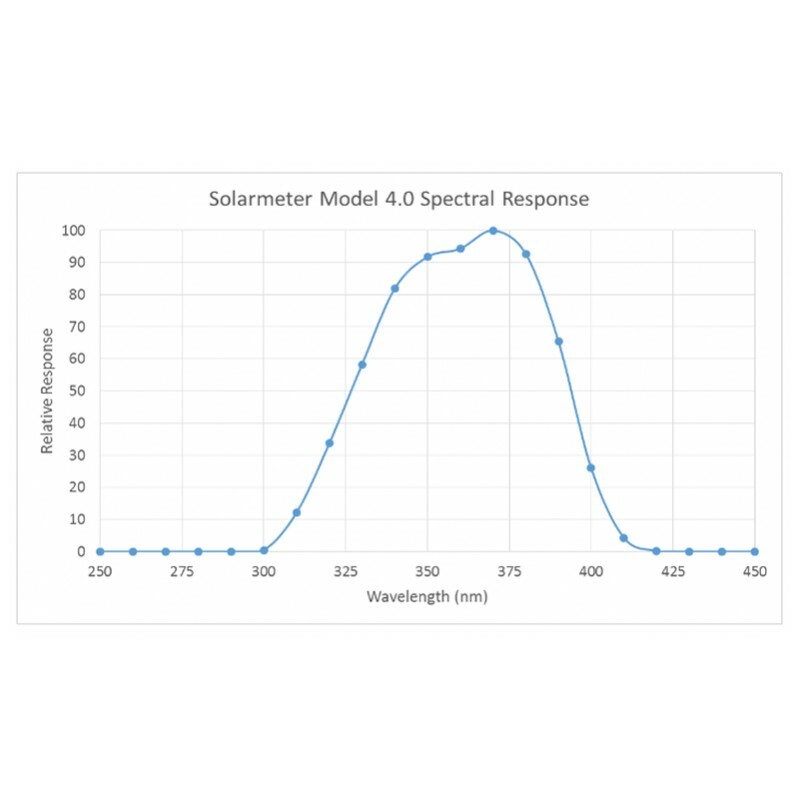 Solar Light also provides NIST traceable spectroradiometric analyses, calibrations for light meters and light sources, OEM instrumentation and monitors, and accelerated ultraviolet radiation degradation testing of materials. Solarmeter® is a registered trademark of Solar Light Company, Inc.